What do you do with two pups, one who needs to learn to relax a bit, one who needs to learn to have a little extra zip? Well, while we weighed our calves today, Daniel’s plan was to tie them together. Eden is ready to rush and “get ’em” and she needs to learn to be calm. 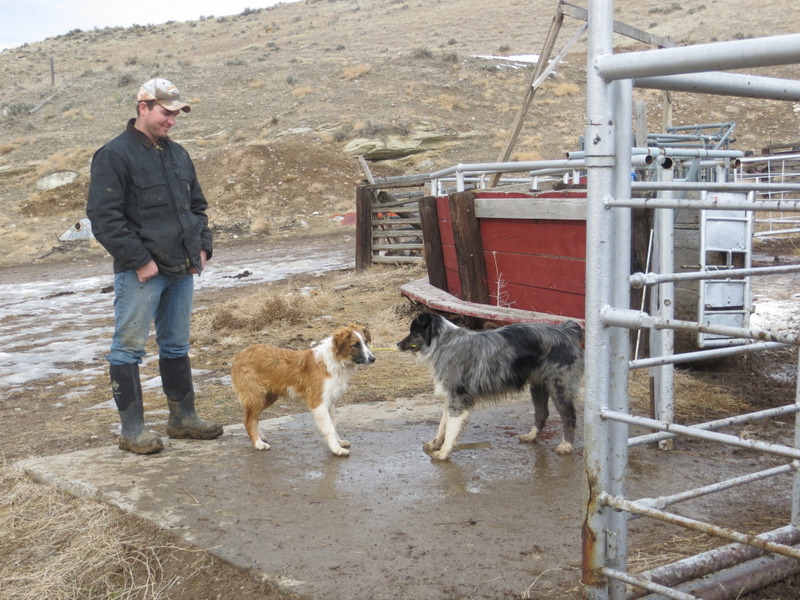 Tuff is calm, but Daniel wants him to learn a bit more aggression. We realize they’re pups, and time will be the best teacher… but Daniel couldn’t resist. It reminded me of the stories I heard about old timers beating the old dogs when the pups misbehaved. 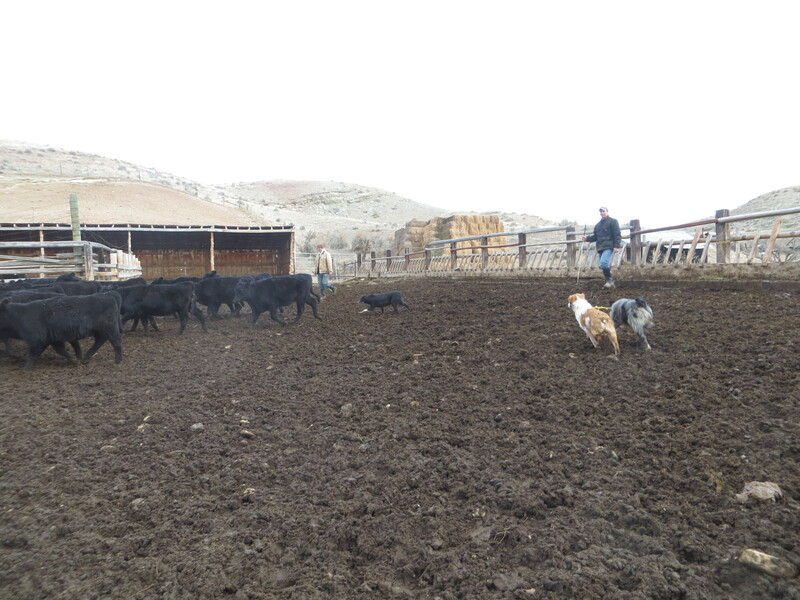 Pretty soon, the old dogs kept the pups in line… Maybe this pulling contest will teach the other to look at things a bit differently. We predicted larger Tuff would be dragging Eden along. It didn’t take long to figure out who was more dominant in this situation! Since it was calves in the lot, and they don’t need much pressure, I let the pups go in there tied as well. Eden didn’t know what she was doing, but she was going to chase calves and Tuff wasn’t going to slow her down! It was an interesting, although short, experiment. Tuff quickly chewed through his end of the baling twine. Eden, outweighed and shorter, still had plenty of enthusiasm and Tuff was just happy to be rid of her! 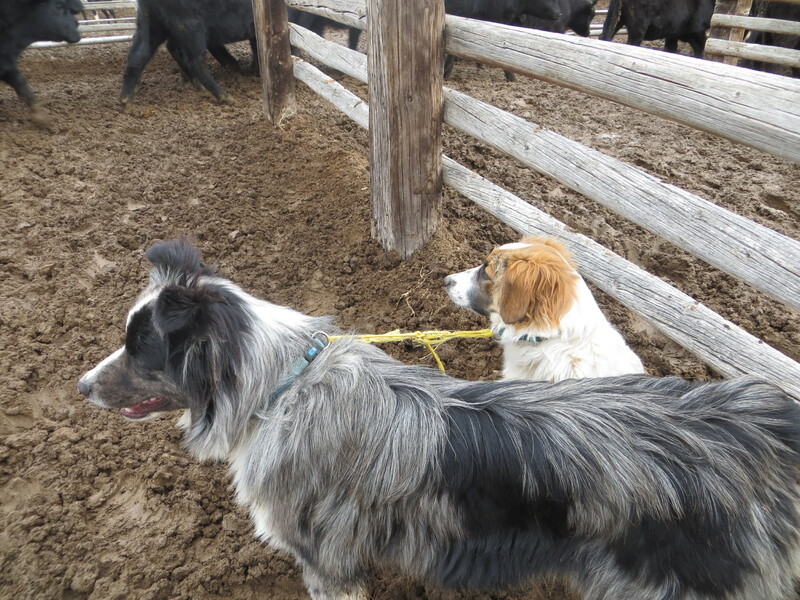 I guess it’s still up to me to teach her to be more calm around cattle… as if 10 minutes of being paired with Tuff would do it! 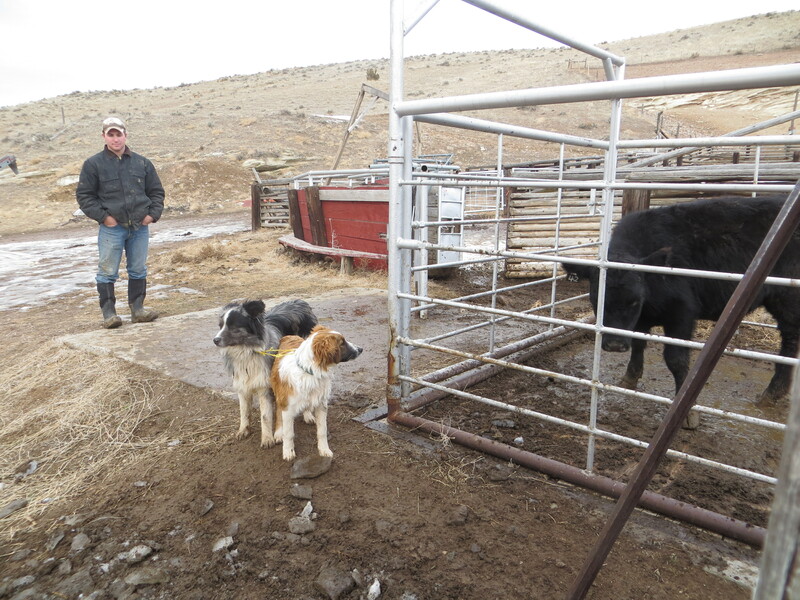 I always enjoy your stories, and especially your photos, of ranch life and Wyoming. But tying dogs together and then thinking that situation is worthy of some giggles, well, I simply don’t get it. To my way of thinking, it’s just flat out cruel That you found it entertaining is upsetting. Your comment about the old timers beating the older dogs when the young ones misbehaved reminds me of an Australian Shepherd we had when I was a teenager. He was so smart it wasn’t even funny. When my sister got another dog (The Aussie was technically my sister’s dog) and I also brought home a new puppy, suddenly chickens were getting killed. We tried everything to stop the pups from killing chickens and nothing worked. Then one day I happened to look out the window and saw Toby egging on the pups with the chickens. From that time on, when a chicken got killed I scolded Toby. You know what happened? Yep, the chicken killing came to a grinding, screeching halt! Very interesting! Different pups are like different kids!